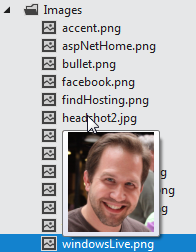 There's a bunch of new stuff in Visual Studio 11 Express for Web that I suspect not everyone noticed. Remember that Express is our free version of Visual Studio. Sometimes I hear folks complain that Express isn't advanced enough, even though its free. For example, no one noticed that Unit Testing is in Express. You can add a Unit Test to an existing Web Solution. I'll add a Unit Test Project, the right click on References and add a reference to System.Web.Mvc to my ASP.NET MVC Application. Note the new Add Reference dialog? It's got a search box, it's multi-threaded, and I can add multiple references by checkbox. That's new stuff, friends. Subtle, but it is one of those "death by a thousand tiny cuts" things that the team is trying to fix. 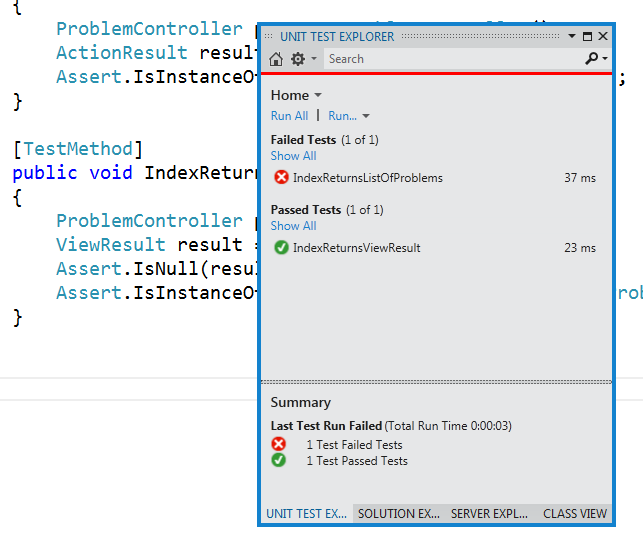 I can setup a bunch of tests for my ASP.NET MVC application and run them by right clicking "Run Tests." If you hover over an image in the Solution Explorer you'll see a preview thumbnail of that image. 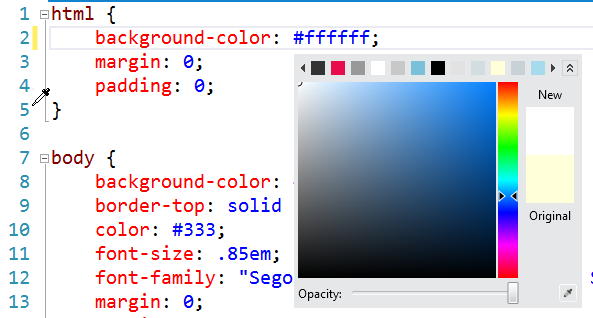 Not only does the new CSS editor support lots of snippets like @media as well as outlining and vendor-specific prefixes, it also has a lovely color picture that is smart about your color scheme. Hint: select a color in a CSS file and press Ctrl-J. ...that looks like this. That's lovely jQuery documentation, as you type. Sometimes when you get partial views inside master pages with editor templates and other nested things in a large application it can be hard to figure out the answer to something simple like "what line of code made THAT line of HTML?" 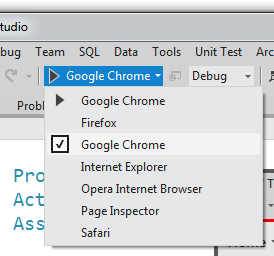 There's a new feature built into Visual Studio Express for Web called "Page Inspector." It's hard to explain, so here's an animation. You hover over an item in the browser and it shows you what line of code make that HTML. You can also do live CSS editing. You know how you never want to install a new version of Visual Studio because you're afraid it will upgrade your existing project files and mess up the whole team? 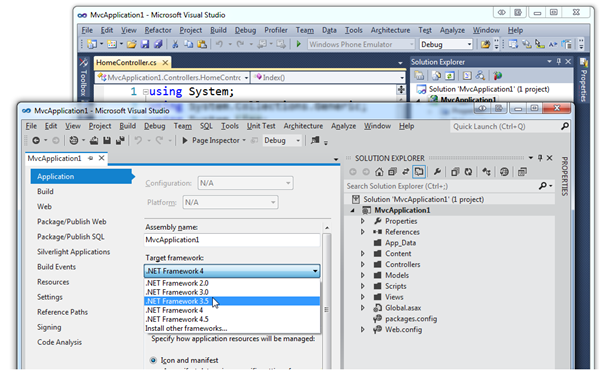 Round Tripping works now between Visual Studio 2010 SP1 and Visual Studio 11. Here's the same .NET 4 application opened in the VS11Beta and in VS2010SP1. Oh, and by the way, don't sweat the color thing, I'm confident it will turn out OK. Note the dropdown in VS11 Beta. I can develop any .NET app from .NET 2 (!) and up with the one IDE. I'm using the beta as my main IDE currently. I'm surprised no one has figured this one out yet, but I'll post on it a little more as I start to share more of the "One ASP.NET" plan. Check out Tools | Extensions. See those template packages? 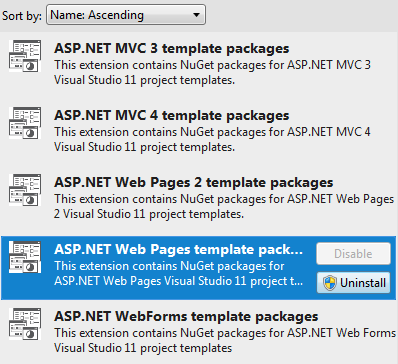 ASP.NET templates (those are the File | New things) are actually extensions...VSIXs, in fact. We can update them as we like now. ASP.NET can do interesting and innovative things (and NuGet plays a part in this) without waiting for a new version of Visual Studio. Starting to see why that'd be useful? That's just the stuff I can think of off the top of my head. Point is, better free tools and more open source continues to be the goal with our team. There's lots more details and videos up at http://www.asp.net/vnext. You can get Visual Studio 11 Express for Web here. Let me know if you find any good bugs and I'll get them straight to the team, or better yet, put feedback on our UserVoice site. Web Developer Tools Team Blog - Subscribe! Sponsor: My thanks to DevExpress for sponsoring this week's feed. There is no better time to discover DevExpress. Visual Studio 11 beta is here and DevExpress tools are ready! Experience next generation tools, today. Having Unit testing in the Express SKU is huge, everyone should test! Does this mean that the Unit Testing Explorer is now available in Visual Studio 11 Professional too? If so, has any work been put into making it more easily extensible (to allow third party testing frameworks to add their results to it)? Yes, Unit Testing is in Express and up. Also, all the SKUs above Express support pluggable unit testing, so you can add in NUnit, MbUnit, etc. Browser Chooser/Launcher in the Toolbar was really needed (i used browser switcher before) and Page Inspector is great addition, such a a simple yet powerful/productive tool. I think sometimes it takes a post like this to point out how amazing the free offering of VS is. It's a massive olive branch from Microsoft (IMO) - I wonder how many developers paying for the full versions only use the features of the free version. Also, I really like how VS is becoming more modular, so different areas can iterate at different speeds, without needing to move at the speed of the slowest all the time. Oh wow, looks like I don't have to shell out money for advanced editions ever, though I have always lived with express. For me the best feature is also the pluggable unit testing, so you can add in NUnit, MbUnit, xUnit etc. And seems to be faster than the previous version. The new Metro UI looks clean but I am still getting used to the new Metro icons. Its hard distinguishing them from each other. I would like to know if database projects synchronize / deploy schemas between local and sql azure databases. The ability to use extensions is great! However, will it be filtered to a pre-defined subset of extensions or be open to 3rd party extensions like CodeRush and ReSharper? Why make the icons for test failed/succeeded red and green? Wouldn't it be so Metro to make them black. Color is so yesterday. Since the rest of my team is still on VS 2010 this is the only thing stopping from using VS 11 as my main IDE. If only .Net 4.5 didn't break our app and cause me to spend a day uninstalling everything and reinstalling to remove the stuff .Net 4.5 put on my machine. Still concerning VS11, Scott, please use your influence to bring back color in VS11, at least for icons! Be careful with hoping that 2011 beta will run side-by-side with 2010 SP1. The Async CTP, for one, conflicts in a bad way with 2011 beta and .NET 4.5. I ended up restoring a fresh OS image when I couldn't restore my environment after installing 2011 beta. I also notice that VS11 Express beta has support for VC++ x64 targets and it works. Oh happy day! Meanwhile, when will we know what is going to be missing from VS11 Express? I notice, for example, that there is no template for an empty (I mean *empty*) initial C/C++ console project in the beta. I don't mind doing command-line builds to get around that, but as an inviting tool for C/C++ beginners and folks learning from books, that is a big fail. Thanks Richard. Yeah almost sounds like the best way to beta test is on a seperate os image. I have noticed one of them and few other. Big secrets? See also: The CSS property "bikeshedding" appearing in Intellisense, at least in full-on Visual Studio 11 Beta. Wow! on mouse over we can see image Thumbnails and color picker in CSS editor. Really VS11 is awesome this is what current developer need! Having a possibility of running a single test per time or all tests from a file, and not from all your solution would be perfect, but no... WE GOT NO OPTION LIKE THAT !!! Can't say enough how great it is to see NuGet in the Express Edition. Quite the dilemma Microsoft has trying to fight the Ruby-ish world by balancing a truly useful free version of the dev tools with giving away a solid revenue stream. Established corps have no problem paying for VS, but start-ups are leery of costs. Bizspark helps but can feel to some like a tasty treat with a hook in it. I look forward to trying this version of VS 11! VS11 is really turning out to be completely awesome. Thanks for sharing all the tips, one that I'd like to add is that there is now full intellisense on all the WCF options in the config files too! Justin - As I understand it, there is still restrictions on Extensions in EXPRESS. There are some internal extensions like NuGet and ASP.NET and can get in there. Bob - Break it how? I need details to fix it. The only breaking changes I've heard about were when folks were using reflection to talk to privates and internals that moved. Patrick - Awesome! I didn't know there was a /diff option! glad to hear someone is confident about the color issue! Oh my God! Finally MS got around the references dialog. It about time guys, actually it is several years too late. Anyways I'm glad the disaster is gone and you can focus on removing other disasters plus chase your competition cause there are many things in other IDEs that VS lacks and when you consider the price (VS is actually very expensive) your expectations rise. tc - ;) The free version of VS is pretty functional, as I think I mentioned here. The pro version is something like $500 so I think for a professional developer it's reasonable. "Sometimes I hear folks complain that Express isn't advanced enough, even though its free." -- Would be nice to have a pro-like version (being able to have ad-ins is the only thing one would miss) only for open source projects. "IIS Express is now the default website host" -- while nice, I've seen it crash / hang VS way more than Cassini; hopefully that's fixed. This version has a lot of exciting small / useful features. If we could just fix the colors/icons it would be great :-) Why not just allow us to theme the VS, too much work? How did you get intellisense for jQuery documentation working like that? I've tried many different ways using the references with no luck on getting the documentation. I get "Intellisense was unable to determine an accurate completion list for the expression"
Thanks a lot, Scott. Was curious when I blogged about _references.js file ( http://bit.ly/_referencesjs ) thinking it must be coming from somewhere, and now your post explains it pretty well. Can IIS Express host a x64 web? I have a problem because I debug in x86 with my Oracle.DataAccess.dlls then I have to change and publish the x64 versions. Does that mean ASP.NET Web Forms are now completely out of band? The browser is a welcome addition (though past versions of VS do something similar). I'd like to make one suggestion though. I use multiple Firefox and Google Chrome profiles. One for regular browsing and another for web development/debugging. This ensures that I don't mess up my history/profile/cookies etc with my development activities. However, the feature you've described launches the browser with no command line parameters. So, is there a way I can add/update/customize the parameters used to launch the different browsers? 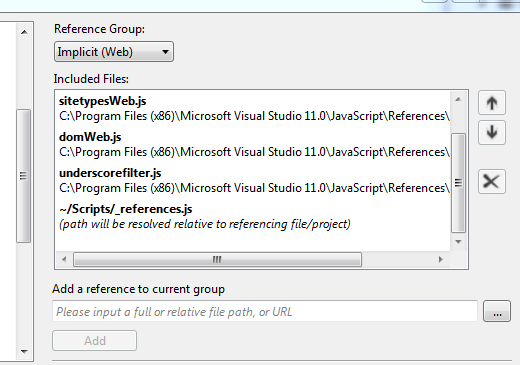 And if not, is too late to suggest this as a feature request for VS11? The new Metro UI icons are hard distinguished from each other. And the whole UI looks PALE, no contrast at all. Can make the new VS theme/skin selectable, so that we can choose other theme? Wow! I thought the VS team would never realize how painful is to switch from one version to another, I mean, they had to see all those projects with project-vs2k10.sln and project-vs2k8.sln. I think this is one of the biggest things for me! Most of the others are very nice also, but this one saves huge amounts of pain... Thanks for sharing! Amazing, lots of stuff coming in vs2011, but I wish vs2011 could have the ability to play around with collection or search in them like BugAid, that really can be "mind blowing build-in feature". The new Browser Launcher toolbar button is brilliant and sorely needed, I can't count how many times Visual Studio keeps forgetting what I want my default dev browser to be and having to dig around in the current dialog box to set it back to what I want. Is this tied to the Quick Launch bar as well though? Thanks to your previous post about simplifying your IDE I've removed all my toolbars but really want access to this feature quickly. Do you know if its now possible to execute ms test projects without visual studio installed? This is useful in a continuous integration environment. That's why VS is and will still be the best IDE by far! Anton - You should be able to run mstest.exe from the command line, yes. Aidan - Not yet, but we're looking at that. Parts of ASP.NET like Web API are out of band and can be used in Web Forms. x64 web guy - Yes and no. No, there isn't an x64 version of IIS Express 7.5, but YES there is both x86 and x64 versions of IIS Express 8.0, coming soon. You can see the IIS Express 8 READ with details. No - one noticed because all we wanted is a faster, slicker Visual Studio. Thankfully we got it...although it can be improved. 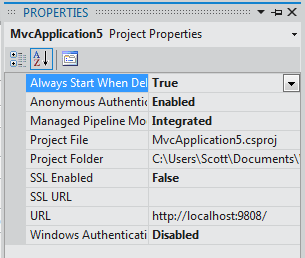 As testing is allowed in the express edition, why is the checkbox in the mvc4 project wizard still greyed in VWD 11 express? I have a idea for VS11 improvemnt. suppose I have saved image in Expression design and put image src tag. when I click browser and try to see the image image is not their. For doing this I need to click refresh files in Sollution explorer. Can you made a thing then I am able to browser without clicking refresh Everytime. When my neighbour click most of time on refresh in sollution explorer I have noticed them what they do. Thanks for this post.I like to hear from you on this. fhallot - Testing will be enabled in MVC under Express in the final version. It was a schedule thing for the beta. Thanks for noticing! >>Things that works in IIS Express should work the same way in IIS because it's the same core web server. 1. IIS Express/Cassini run at the root level - so resources added assuming that fail on IIS. 2. IIS Express/Cassini are usually run as admin, not as a service with the application pool identity. Unit testing in the express versions is a nice addition as it helps beginners to write good code from the start. @Scott Hanselman: no Scott, the VS2010 Pro version (since MS dropped the cheaper Standard version starting from 2010) is nothing like about 500USD in my country. Now when you compare it to JetBrain's IntelliJ IDEA which costs 474 EURO that in my case gives me equivalence of about 628 USD I'd say that Visual Studio is pretty expensive. Now IDEA is generally considered the best Java IDE which is exactly what VS is for .NET so I guess it's fair to compare their prices. I don't have any direct experience with IDEA, but I have with other IDEs from JetBrains and I found them packed with features that are in VS only when you extend it with R#. So to me it feels like every JetBrains IDE has R# for a given language built-in. Also I found JetBrains IDEs to be very well thought in terms of usage and productivity (i.e their settings windows has a search built-in so you can quickly find what you need). Now back to IntelliJ IDEA, since this is their oldest IDE and the building foundation for the other IDEs (they have a common "framework" for IDEs) I'm expecting IDEA to be full of the features I found in JetBrains' other products like WebStorm, PyCharm and RubyMine. My biggest issue with Microsoft is probably making things 80% complete and bragging about them everywhere. MS benefits from the fact that most .NET devs do not peek at their "competittion" and take things for granted and swallow the MS marketing message and think to themselves "what a great JS support we have now". I suppose every IDE has its strong and weak points but over all VS is pretty expensive. BTW. Why MS keeps calling VS the 2011? It's 2012 already and there's even no release date yet. @tc in Spain VS 2010 Pro is 534 EUR, which at today's rates is 708 USD, so not quite as bad as your situation - but still expensive. This price is from the Microsoft Online Store, but VS 2010 Pro does not seem to be available from them, in Poland, for some reason. I think MS needs to stop trying to milk developers outside the USA quite as much. Many small independent developers end up generating a lot of revenue for MS at the end of the day. In this google group for foundation, i was asking if i could use scss with visual studio express. The answer came back as no. Is it possible that i can use scss extensions with vs2012 express? i am to new to scss to know if the problem is me or the platform. i install foundation using compass but when i preview in browser with vs2010 it does not seem to acknowledge the scss files.